The Last Wave tells the story of young tax lawyer, David Burton, who takes on the defence of five city Aboriginal people who seem to have killed one of their own under tribal law - but as the government doesn't acknowledge that there are tribes in the city, defending the men appears to be impossible. David's efforts are frustrated by the defendants, who refuse to cooperate with him. But he experiences recurring dream images of defendant, Chris Lee, and a mysterious older native named Charlie turns out to be a shaman who identifies David as being from an ancient tribe from the West. David begins an odyssey involving strange natural occurrences – all centring on water – in down-town Sydney. His obsessive research eventually leads him to surmise that some kind of cyclical cleansing of the earth is in the offing, an apocalypse predicted – or created – by the magic of Aboriginal people, a massive, apocalyptic tidal wave. David Gulpilil dominates the film with his performance as Chris Lee. 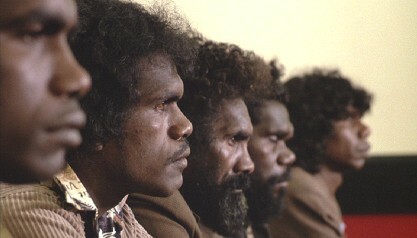 The five Aboriginal people who are charged with murder in The Last Wave by Peter Weir. Thanks to Jacinto Aganza for pointing me to this movie. In the USA The Last Wave is known as Black Rain.